The heart is the organ that helps supply blood and oxygen to all parts of the body. It is divided by a partition or septum into two halves, and the halves are in turn divided into four chambers. The adult human heart has a mass of between 250 and 350 grams and is about the size of a fist. It is located anterior to the vertebral column and posterior to the sternum. It is enclosed in a double-walled sac called the pericardium. The superficial part of this sac is called the fibrous pericardium. This sac protects the heart, anchors its surrounding structures, and prevents overfilling of the heart with blood. The outer wall of the human heart is composed of three layers. 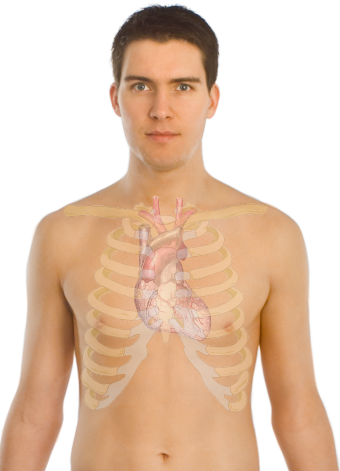 The outer layer is called the epicardium, or visceral pericardium since it is also the inner wall of the pericardium. The middle layer is called the myocardium and is composed of cardiac muscle which contracts. The inner layer is called the endocardium and is in contact with the blood that the heart pumps. Also, it merges with the inner lining (endothelium) of blood vessels and covers heart valves. The human heart has four chambers, two superior atria and two inferior ventricles. The atria are the receiving chambers and the ventricles are the discharging chambers. The pathway of blood through the human heart consists of a pulmonary circuit and a systemic circuit. De-oxygenated blood flows through the heart in one direction, entering through the superior vena cava into the right atrium and is pumped through the tricuspid valve into the right ventricle before being pumped out through the pulmonary valve to the pulmonary arteries into the lungs. It returns from the lungs through the pulmonary veins to the left atrium where it is pumped through the mitral valve into the left ventricle before leaving through the aortic valve to the aorta. • Diastole Phase – the heart ventricles are relaxed and the heart fills with blood. • Systole Phase – the ventricles contract and pump blood to the arteries. Heart and blood vessel disease cardiovascular disease also called heart disease — includes numerous problems, many of which are related to a process called atherosclerosis. Atherosclerosis is a condition that develops when a substance called plaque builds up in the walls of the arteries. This buildup narrows the arteries, making it harder for blood to flow through. If a blood clot forms, it can stop the blood flow. This can cause a heart attack or stroke. Heart attacks and strokes are key components covered in workplace approved first aid and CPR programs offered with our training partners. The heart works 24 hours a day, pumping oxygen and nutrient-rich blood to the body. Blood is supplied to the heart through its coronary arteries. If a blood clot suddenly blocks a coronary artery, it cuts off most or all blood supply to the heart and a heart attack results. Cells in the heart muscle that do not receive enough oxygen-rich blood begin to die. The more time that passes without treatment to restore blood flow, the greater the damage to the heart. An ischemic stroke (the most common type) happens when a blood vessel that feeds the brain gets blocked, usually from a blood clot. When the blood supply to a part of the brain is shut off, brain cells will die. The result will be the inability to carry out some of the previous functions as before like walking or talking. A hemorrhagic stroke occurs when a blood vessel within the brain bursts. The most likely cause is uncontrolled hypertension. Some effects of stroke are permanent if too many brain cells die after a stroke due to lack of blood and oxygen to the brain. These cells are never replaced. The good news is that some brain cells don’t die — they’re only temporarily out of order. Injured cells can repair themselves. Heart failure: This doesn’t mean that the heart stops beating. Heart failure is a serious condition in which the heart is not pumping blood around the body efficiently. • Congested lungs: A weak heart causes fluid to back up in the lungs. This can cause shortness of breath with exercise or difficulty breathing at rest or when lying flat in bed. Lung congestion can also cause a dry, hacking cough or wheezing. • Fluid and water retention: A weak heart pumps less blood to your kidneys and causes fluid and water retention, resulting in swollen ankles, legs, and abdomen (called edema) and weight gain. This can also cause an increased need to urinate during the night as your body attempts to get rid of this excess fluid. Bloating in your stomach may cause a loss of appetite or nausea. • Dizziness, fatigue, and weakness: Less blood to your major organs and muscles makes you feel tired and weak. Less blood to the brain can cause dizziness or confusion. Rapid or irregular heartbeats. The heart beats faster to pump enough blood to the body. This can cause a fast or irregular heartbeat. Arrhythmia: problem with the rate or rhythm of your heartbeat. It means that your heart beats too quickly, too slowly, or with an irregular pattern. Bradycardia is when the heart rate is less than 60 beats per minute. Tachycardia is when the heart rate is more than 100 beats per minute. An arrhythmia can affect how well the heart works. Heart valve problems: occurs when your heart’s valves do not work the way they should. When heart valves don’t open enough to allow the blood to flow through as it should, it’s called stenosis. When the heart valves don’t close properly and allow blood to leak through, it’s called regurgitation. When the valve leaflets bulge or prolapse back into the upper chamber, it’s a condition called mitral valve prolapse. When this happens, they may not close properly. This allows blood to flow backward through them. Valve Stenosis. This means that the opening of the valve is narrowed and the valve does not open fully. So, there is some restriction in blood flow through the valve. Valve regurgitation (sometimes called valve incompetence or a leaky valve). This means that the valve does not close properly and there is backflow of blood through the leaky valve. Any of the valves can be affected by these problems. However, the mitral and aortic valves are the ones that most commonly become diseased. See separate leaflets called Mitral Stenosis, Mitral Regurgitation, Aortic Stenosis and Aortic Regurgitation for details of these conditions. Excellent treatments for heart attack are available that can save lives and prevent sudden death. Its treatment is most effective when started within one hour of the beginning of heart attack symptoms. If patient get help during that first hour then chances of recovery increased. Many people hesitate to help heart patients because lack of knowledge and right information. By performing simple procedures and following certain guidelines, it may be possible to save lives by giving basic treatment until professional medical help arrives. Remember, too, that practice makes perfect. In an emergency there’s no time to read instructions. If you’ve memorized some of the basic procedures, it will help you react quickly and efficiently. Learn more by enrolling in a course today.